The post Major Egyptian tourism markets’ RevPAR to grow by 18% in 2019: Colliers appeared first on Daily News Egypt. The post IFC ready to invest in Egypt’s hotel development fund appeared first on Daily News Egypt. The post WTTC announces Egypt as 2019 Global Champion for Tourism appeared first on Daily News Egypt. The annual WTTC Global Champion awards recognise outstanding public officials or countries who, through their leadership, have made a difference by means of pioneering public policies and initiatives which increased the competitiveness of the sector within their respective countries. The WTTC Global Champion award for resilience recognises Egypt’s strong leadership which has demonstrated success in recovering from adverse events. Egypt’s tourism sector led a robust recovery. In 2018, Egypt’s travel and tourism sector continued its impressive growth (16.5%), according to WTTC data, ahead of the global average of (3.9 %). This growth has been linked to the hugely improved security infrastructure, which has helped to attract international visitors back to Egypt’s shores, and has allowed major global travel companies to restart operations in popular destinations and increase their businesses in new tourist developments on the coasts of both the Red and the Mediterranean Seas. Upon receiving the award, Al-Mashat said, “The ministry of tourism has adopted a new approach, the ‘Egypt-Tourism Reform Programme (E-TRP)’, designed to modernise the sector by implementing structural reforms which strengthen Egypt’s competitiveness and are in line with international standards. The post Egypt discusses enhancing tourism cooperation with Spain, Bulgaria appeared first on Daily News Egypt. The post Middle East visitors to Egypt to increase by 50% by 2022, ATM report reveals appeared first on Daily News Egypt. The post Egypt’s tourism revenues hike by 38.7% during H1 of current FY: CBE appeared first on Daily News Egypt. Egypt’s tourism revenues jumped by 38.7% during the first half (H1) of the current fiscal year (FY), reaching $6.8bn, compared to $4.9 in the period from July to December 2017, according to the Central Bank of Egypt (CBE). The CBE explained in its initial report on the Egyptian balance of payments that the travel surplus rose to about $5.4bn during H1 of the current FY, up from $3.8bn in the same period last FY. According to data released by the World Tourism and Travel Council (WTTC) last month, tourism in Egypt has witnessed a huge boom and recovery during 2018, estimating the value of tourists’ spending in Egypt last year at $12.2bn. The WTTC predicted that the number of tourists coming to Egypt during 2019 will reach 11.7 million tourists. Notably, the tourism industry in Egypt has been full of ups and downs since the 25 January Revolution. The sector in Egypt suffered a devastating blow, especially when a Russian passenger plane crashed in Sinai in late October 2015, and all its passengers were killed. Following the plane crash, Russia imposed a travel ban on Egypt, while the UK suspended all flights to Sharm El-Sheikh amid concerns over the airport’s security measures, banning travel to Sinai. However, although Russian tourists have not returned to Egypt until now, Egyptian tourism has recovered some of its revenues since the past year. Currently, tourism is recovering as in addition to the hike in the tourism revenues, previously, the Minister of Tourism, Rania-Al-Mashat, said that the number of tourists to Egypt increased by 40% during the first nine months of 2018 (9M18), compared to the same period last year. Thus, Daily News Egypt decided to dig further into the reasons behind the hike in the revenues during the aforementioned period, clarifying the markets that compensated part of the absence of Russian tourists, in addition to revealing if new tourism markets entered Egypt during the same period. For his part, Hesham El Damery, the retiring president of the Tourism Promotion Authority, told Daily News Egypt that Egypt is witnessing a contiguous increase in revenues since 2017, clarifying that the main reason behind this increase is the political and security situation stability witnessed in the country that helped in improving the stereotypical image of the state. As the touristic map or the touristic base is an expression which means the nationalities that top the visitors to Egypt during the year 2018, El Damery stated that the hike in the revenues is due to increasing visitors from Germany, followed by the Arab market, then the Ukrainian market comes in the third palace followed by the Italian markets and then the British. He continued that the increase is also due to having new diverse source markets including people from Eastern Europe, the Arab world, and Asia such as Indian, Japanese and Chinese markets. El Damary explained that since 2015, Egypt began to attract non-traditional markets, including people from Ukraine and Poland. He noted that before 2014, only four markets existed which are Russia, Germany, England, and Italy and they represented more than 75% of Egypt’s annual tourism revenues. Noteworthy, before the 25 January Revolution, Russian tourists were ranked number one in the touristic map of Egypt, followed by British and German tourists. El Damery saw in the travel ban an advantage. He explained that the average tourism spending in the last two years increased as the touristic base in Egypt changed, elaborating that the average spending of the Russian tourist is low, but now after the travel ban, Egypt witnessed visitors from US, the Gulf, and the Asian markets whose average spending is much higher than the Russian. Agreeing with El Damery, Ali Ghoneim, member of the Egyptian Federation of Tourist Chambers, thinks that the main reason behind the rise in the revenues is the stability of the political and security situation in Egypt. Also, he agreed with El Damery that the German market is ranked first in terms of the top visitors to Egypt in 2018. Ghoneim stated that 2018 witnessed the entrance of new source markets in Egypt including India, China, and Latin America. Finally, they both are optimistic about the growth of Egypt’s tourism revenues in the next period. The post Egypt participates in WTTC Global Summit 2019 appeared first on Daily News Egypt. The Minister of Tourism, Rania Al-Mashat, traveled on Monday to Spain in order to participate in the 19th session of the World Travel and Tourism Council 2019 (WTTC Global Summit 2019), that is held in the period from 2 to 4 April in Seville. Al-Mashat will participate as the official speaker in the session titled Global Leaders Dialogue, which will be attended by ministers from a number of countries, including Spain’s Ministers of Industry, Trade and Tourism, as well as the mayor of Seville, as well as tourism and travel industry officials from various countries. During this session, they will present and discuss the policies and successful experiences of the governments of some countries in order to increase their competitiveness in the field of tourism and travel. Al-Mashat pointed out to the importance of Egypt’s participation in such international forums, in the light of the ministry of tourism’s plan to develop its relations with international institutions. She explained that participation in international forums is considered as one of the main elements of the institutional reform axis of the structural reform programme adopted by the ministry for the development of the sector. Notably, the WTTC Global summit is one of the most important annual events on the world tourism events agenda. The annual event is attended by a large number of leaders in the tourism and travel industry around the world, which makes it a platform for gathering the tourism industry’s decision-makers with representatives of the private tourism sector. The event aims for both sides to discuss the future of the tourism industry, as well as increase awareness on the economic and social impacts of this industry on the world. Last week, the WTTC announced the findings of the 2018 tourism performance, comparing travel and tourism in 185 countries. It explained that tourism in Egypt has witnessed a huge boom and recovery in 2018, describing Egypt as the fastest growing tourism market in North Africa. The post Arab market represents 30% of incoming tourism to Egypt: Al-Mashat appeared first on Daily News Egypt. The Minister of Tourism, Rania Al-Mashat, said that the Arab market is one of the most important exporting tourism markets to Egypt, which represents 30% of incoming tourism, noting that Saudi Arabia comes at the head of those markets. “According to the report of the World Tourism and Travel Council, tourism in Egypt witnessed a boom in 2018, becoming the fastest growing country in North Africa with a growth rate of 16.5%, well above the world average of 3.9%,” Al-Mashat added. The minister’s remarks came during her meeting with Ahmad Al-Khateeb, the chairperson of the Saudi Commission for Tourism and National Heritage (SCTH) during the 45th meeting of the World Tourism Organization’s Commission for the Middle East, which was hosted by Egypt. During the meeting, they discussed aspects of cooperation and enhancing tourism between the two countries. For her part, Al-Mashat assured the deep ties between Egypt and Saudi Arabia in all fields, noting that the ministry developed the concept of sustainable tourism as a key element in the structural reform programme for the development of the sector, referring to the Green Star programme, which issues sustainability certificates for hotels that comply with environmental and social management standards and requirements. Finally, she stressed the possibility of transferring Egyptian expertise in this field to Saudi Arabia. In that context, the chairperson of the SCTH stated that his country has begun to promote various tourism products such as cultural tourism and adventure tourism. He also highlighted Saudi Arabia’s desire to benefit from the Egyptian expertise in these fields. Finally, Al-Khateeb expressed his happiness due to his presence in Egypt, noting that Saudi people are always keen to visit Egypt and enjoy its unique touristic attractions. The post Tourism’s structural reform programme cornerstone to achieve sustainable development: Madbouly appeared first on Daily News Egypt. Prime Minister Mostafa Madbouly stated that tourism’s structural reform programme is considered as a cornerstone for achieving sustainable development, which Egypt seeks to achieve at all levels, in accordance with Egypt’s Vision 2030. Notably, the structural reform programme was launched by the ministry of tourism with the aim of achieving sustainable tourism, in line with the UN sustainable development goals. He added that the tourism sector in Egypt is one of the most important sectors supporting the national economy, as it affects the lives of millions of Egyptians. His remarks came during the opening session of the regional forum on the side-lines of the 45th meeting of the UN World Tourism Organization (UNWTO) Commission for the Middle East, in cooperation between the Egyptian Ministry of Tourism and the UNWTO on technological innovation in tourism. The prime minister assured the role of tourism in supporting and developing the national economy as it is one of the most important sectors contributing toward job creation and is considered the fastest growing sector and one of the most important fields contributing to exports. He affirmed that all the state bodies cooperate in order to ensure a unique tourist experience in Egypt, through working to improve the infrastructural projects, including the national networks of roads and bridges, and by developing and expanding the subway network, in addition to extending new lines to link different areas in the capital. “As long as we talk about Egyptian tourism, we should refer to the Grand Egyptian Museum, as it will be the largest museum around the world and the most important because it contains a huge number of pieces and rare archaeological treasures and will be an important pillar of cultural tourism in Egypt,” he confirmed. The post Egypt tops list of billionaires’ most visited countries in 2019 appeared first on Daily News Egypt. Amid tremendous efforts from the government to revive local tourism, Egypt was announced as the number one destination among a list of 15 countries, which international billionaires plan to visit in 2019, according to a study held by Business Insider. The number one business website held a study with Original Travel agency, which plans months-long-trips for wealthy people to spend their vacations with their families, in order to figure out the top 15 countries where the world’s wealthiest individuals are planning to spend their breaks in, and Egypt was their first choice. Noticeably, the study showed that the world’s elite seek challenges and activities in 2019, to replace the classic and calm countries such as the United Kingdom and France. When it comes to Egypt, it topped the list beating Iceland, Japan, Colombia, and Oman from the Middle East. Original Travel’s co-founder, Tom Barber, told Business Insider that the agency’s 2019 bookings for Egypt are set to triple from last year’s bookings. He explained that tourists are mostly attracted toward two main destinations: the Steam Ship Sudan, which is a Nile Cruise that roams the country’s most touristic cities, Luxor and Aswan, and stops by the temples, monuments, and tombs. In second place, comes the Grand Egyptian Museum (GEM) which overlooks the Pyramids in the Giza Plateau. While Egypt tops the list, Montenegro this year comes in the last position of the billionaires’ top vacation spots. The post Dahabeya: passage through time on Nile river appeared first on Daily News Egypt. For thousands of years, we have been travelling north and south the river Nile, in various different vessels, ranging from pharaonic papyrus reed vessels to modern day 7-star luxury cruise boats. The changing vessels throughout history have primarily changed the length of time taken to reach destinations, and, by definition, the type of experience we have. A week-long Nile cruise on a luxurious sailing boat from Cairo as far as Abu Simbel, stands in contrast now to the 1880s passage on a dahabeya which would last months–not days–lending the journey experience a meditative aesthetic of the dahabeya, which was changed forever by modern steam boats and luxury cruisers. “The sensing and stretching of time was replaced by a necessity for a condensing of it,” says photographer and dahabeya director Karina Al Piaro. Can you please tell us what exactly a dahabeya is? A dahabeya (Arabic) means a golden boat. Essentially it is a long wooden lateen large triangular sailed passenger craft, with two masts traditionally painted fully in white. These vessels are found exclusively on the Nile in Egypt, and were most ubiquitous for half a century between 1830-1880, significantly impacting the subsequent trajectory of the Nile heritage of that era and beyond. After more than a century of silence, a renaissance of the dahabeya took place with a 21st century revival borne of the desire for a return to a deep heritage memory, allowing access to more contemplative states that ethically align with ecological journeying. It cannot be denied, that the sense of sensorial connection experiences with the Nile river is unsurpassed on a dahabeya, berthing anywhere on the river, at sites normally completely inaccessible to modern cruisers. The classic dahabeya may appear to be an apotheosis to the modern cruiser, and these antique wooden vessels are in fact steel flat-bottomed, designed logistically specifically for river, not sea, use. The huge sail area also means the vessel can sail with ease in the lightest of breezes. All dahabeya vessels that we see today have been universally crafted on classical prototype designs, and would have come from the ship yards of Britain, but the prototype vessel parts were put together later on the Nile in Egypt. In its most basic form and structure, the dahabeya exhibits a design lineage that aligns smoothly with the shallow bronze tinted barges used in the pre-1800s medieval times by Muslim kings and nobility. Also, references to gold itself go back further than this: the dahab (Arabic for gold) of the dahabeya may also refer to what is referred to the dongola decoration on the vessels in their etymology, an affirmation of the culture on a deep Nile heritage reaching Dongola itself in the southern most reaches of Nubia, between the Third and Fourth Cataracts on the Nile–known to be one of the main centres where the ancients obtained gold. Today a handful of authentic early to mid-1800s dahabeyas exist, one of which I am extremely honoured to be able to call part of my personal heritage on the Nile, as a director for almost two decades. The vessel I direct was lovingly restored to its former glory at the turn of the 21st century and stands as a masterpiece of 1800s Nile heritage presently. Originally owned by Farid Al-Atrash, this rare authentic vessel exists in contrast to other contemporary vessels. Modern duplications of the original dahabeya aesthetic currently dwell on the banks of the Nile, mostly berthed at ancient Thebes, the modern city we know today as Luxor. None, however, can arguably compare in nuances; the undeniable, unmistakable finely-tuned craftsmanship that even the untutored eye can observe, in the detail and subtle curvature of its white-panelled ceiling, and the soul that speaks a thousand stories within the vessel. Can you tell us about your professional journey as a female photographer, and why the Nile? My father gave me my first camera. I had until that moment dreams of being a painter; a dream that was subsequently eclipsed by the phenomenal quality of light that is the Egyptian sun. Vast varnished canvases, charcoal, and the acrid smell of brushes steeped in turpentine became quickly replaced by seemingly magical, transformational hours of alchemical processes in darkrooms, of endless rolls of negative film, of silver halides and the golden light on the swirling waters of the Nile. For it would be these repeated pilgrimages to the mighty river in Upper Egypt at the turn of the 21st century, based often on a newly restored historical 1800s dahabeya, as a female dahabeya director, with my camera, that I would truly galvanise the process of mastering my craft. It was to become, and still is a time, of what I call self-realising through light writing; as a Nile heritage through a sense of revelation expressed on a white boat once owned by kings and nobility, of destiny through destination .Until this time, it has rarely been expressed that the early years of the pioneering of photography, )Greek: light writing) the visual technology that we know today, was fully realised as a genre with a purpose beyond the merely reproducible and observational qualities in the mid to late1800s, directly as a result of the actions and observations of a female pioneer journeying on the Nile. My personal Nile pilgrimage with my camera on the dahabeya became a 21th century intersection in time, where the past and the present were intermingling and diverging. I was picking up the torch of 1800s transformational journeys undertaken by a handful of pioneering women; women that had come before me well over a century before. The dahabeya rapidly became the preferred modus operandi of the predominantly male exploratory pioneers including photographers and writers of that time; the most celebrated and studied accounts are still to this day predominantly those of explorer and bounty hunter Giovanni Battista Belzoni, photography pioneer Francis Frith, and the celebrated writer Gustave Flaubert. ‘The objectifying gaze’ has become a cliché of contemporary criticism, such as that of Belzoni’s, Frith’s, and Flaubert’s. But what of the eye of the heart? What of the contemplative gaze, or the stare of astonishment? What of the appreciative gaze, or the expectant gaze, or the gaze or rage? What of the eye of the visionary? In contrast to the highly celebrated objective realism of male accounts of the 1800s Nile journeying, less visible but arguably equally powerful rare female memoirs from that time speak now to us of a significantly reflective style and sensibility, leading ultimately to a transformative spiritual awakening, and of a call to action on disembarking. The dahabeya journey presented for women of this time an unequivocal embarkation into a terra incognita of the feminine previously unexpressed without restriction and without boundary; of contemplative meditative details felt through female eyes borne of journeys lasting months not weeks or days. These were in fact hitherto unforeseen expressions of a female consciousness during an era when women were mostly written out of, side-lined, or simply forgotten from public narratives. What do you think the journey from Cairo to the furthest reaches of the Nile signified for the 1800s female protagonists we are discussing here? Reflecting on the memoirs and later achievements of the 1800s, for women that journeyed on the Nile, the dahabeya represented that unchartered, unfettered otherness, not only of an external reality, but an internal one–but a particularly female one. Their accounts from that time speak to us now of a more reflective sensibility leading to a transformative spiritual awakening and of a call to action on disembarking felt through female eyes. Florence Nightingale speaks frequently of visions and of a spiritual awakening on the Nile, “Egypt is beginning to speak a language to me” Nightingale said. Another notable woman journeying at this time on the Nile as far as the Fourth Cataract was Amelia Ann Blanford Edwards, who toured Egypt in the winter of 1873–1874, discovering a fascination with Egypt and the Nile culture. Journeying southwards from Cairo in a hired dahabeya, the Edwards party sailed as far as Philae and ultimately reached Abu Simbel, where they remained for six weeks. Their boat joined a flotilla with another female English traveller, Marianne Brocklehurst, also travelling with a female companion. Brocklehurst and Edwards remained friends. 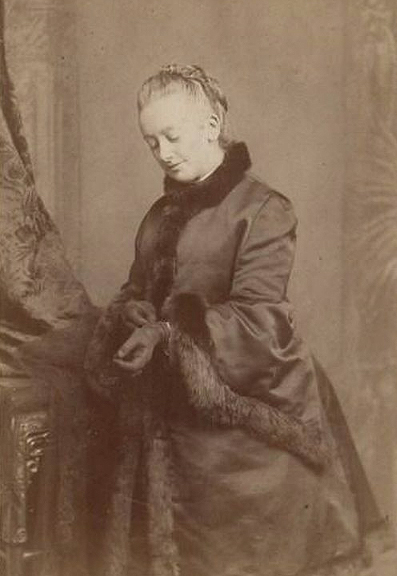 Brocklehurst later supported her with the establishment of the Egypt Exploration Fund in 1882, which still stands today as The Egyptian Exploration Society, a powerful benevolent presence that continues to influence strongly the careers and contemporary trajectory of the realm of Egyptology, as it did in the late 1800s. Edwards‘s vivid description of her Nile odyssey entitled A Thousand Miles up the Nile in 1875, enhanced by her personal illustrations, became an early travelogue that was published as an immediate best-seller. Edwards‘s journeying made her increasingly aware through her observations over many, many months on the Nile of the urgent need to encourage action to conserve ancient monuments and sites of historical significance on the Nile. She set out through a public awareness campaign and scientific endeavour, becoming a tireless advocate for research and preservation of significant Nile heritage. Edwards‘s presence and actions may have seemed radical for her time, but the content of her memoir accounts and later actions reflect, at root, a sympathetic benevolent curiosity and positive intention which seeks to understand and not to judge. Echoing the late 1800s transformative journeying of Edwards‘s and of Nightingale‘s on the Nile, my very early 21st century journeying with my camera began also as a personal pilgrimage. I accepted this calling as an honourable one, embarking on a dahabeya as one would a pilgrim sensing immediately on disembarking, just as my predecessors did, that the dahabeya passage on the Nile is indeed a very special calling and is potentially a metamorphic, life-changing undertaking. Early monochrome photographs by Francis Frith of that time, began to emerge, and one stood out-amongst all others-a photograph of a mysterious wooden vessel aside a temple. 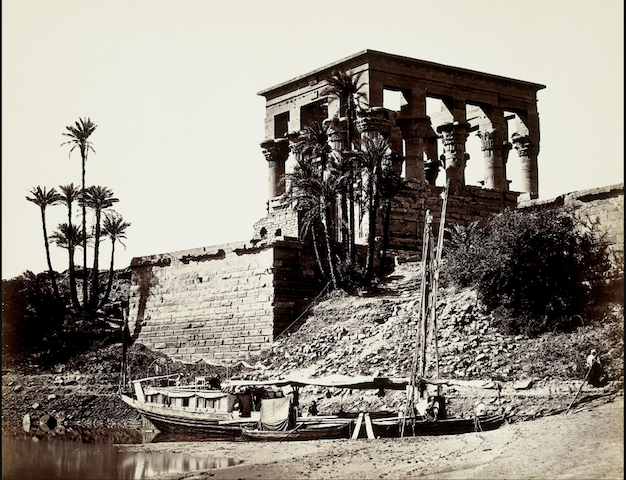 It was an image that had been taken by him in 1867 on the Nile over a century earlier, and the vessel was in fact an early dahabeya that was berthed meditatively at the Temple of Philae. The vessel had in fact astonishingly been used as the photographer’s portable darkroom; I was essentially restoratively continuing this vision. Today I am continuing the creation of my 21st century legacy project on the Nile visually with my camera as the catalyst for my aspiration also to revive the dahabeya as a space; a locus of significant Nile heritage value, in the contemporary realm of hosting and inspiring experts and masters in their fields to gather, exchange, create, and to transform. The mighty lifeblood of Egypt seems to revive all those who journey across it. The ancient Greek historian Herodotus was right when he called Egypt, “the gift of the Nile,” it would seem. The post Tourism Ministry, Diversey to hold conference on hospitality future in Egypt appeared first on Daily News Egypt. The post Foreign tourists spend over EGP 218.1bn in Egypt in 2018: WTTC appeared first on Daily News Egypt. The post Tourism Ministry calls on Air India to re-launch its direct flights to Egypt appeared first on Daily News Egypt. Ismail Abdel Hamid, adviser to the chairperson at the Egyptian Tourism Authority (ETA), affiliated to tourism ministry, called on Air India to re-launch it regular and direct flights to Egypt with the aim of boosting tourists’ numbers between both countries, as well as to promote the joint business relations. “Indian tourists to Egypt doubled last year reaching 126,000, in comparison with 60,000 in 2014. In 2018, we exceeded the tourists’ numbers of 2010,” Abdel Hamid added over his speech at the seminar entitled ‘Know India’ which was held on Sunday. The ambassador of Egypt to India, Heba El Marassi, is set to meet with the Indian Tourism Minister, Alphons Kannanthanam, on Monday 18 March in order to discuss pushing forward the tourism relations between both countries, Abdel Hamid revealed. “India has something for everyone to enjoy, including the historical tourism, adventure tourism, and medical trips with low costs,” he noted, adding that the embassy has launched a campaign to support tourism in February 2019. The embassy looks forward to expanding the people-to-people exchange with Egypt, Bahade stated, affirming the importance of boosting cultural cooperation, including the tourism sector cooperation. Additionally, Mohamed Youssef, the executive director of the Egyptian Business Association (EBA), asserted the EBA’s historical role in supporting Egypt’s tourism sector. Noteworthy, “The EBA launched an initiative in 1997, two months after the Luxor attack and held a huge conference to deliver a strong message to the international community in order to support the city with about 200 businesspersons’ attendance,” Youssef said. “Some economic experts say that the tourism sector is fragile, however, I think it is a very strong sector and it is the fastest sector to recover following the crisis,” he asserted. Moreover, he added, “Egypt needs to exert more efforts to develop its tourism infrastructure,” noting that in 2002, the EBA launched an initiative to develop the neighbouring governorates to the touristic areas. “We persuaded businesspersons to invest in poor governorates in order to supply the tourist areas with its daily needs of food, drinks, and others,” he further mentioned, adding that in 2013, the EBA hosted several events with representatives of Islamic parties to assure that the government will not issue negative decisions for the tourism sector including the beach tourism. India and Egypt are home of the oldest civilisations in the world, Nora Salem, the adviser of the minister of tourism, said, adding that both countries have very rich and diversified tourism products where many countries cannot compete. “The Ministry of Tourism launched its tourism reform programme in November 2018 in the Egyptian Parliament with the support of the Egyptian President Abdel Fattah Al-Sisi,” she mentioned. The vision of the programme is to achieve a sustainable tourism sector in line with the international standards, as well as with the country’s 2030 sustainable development goals, she asserted. “I invite you all to attend our upcoming conference about the digitalisation and start-ups of the tourism sector on 25 March, under the patronage of Egypt’s Prime Minister, Mostafa Madbouly,” she said. The post Hilton Hurghada Resort: Hospitality at its best appeared first on Daily News Egypt. When travelling, I think that we all have some memories that we cherish, and places that we will never forget. Once you spend an enjoyable time at a nice place, you will not be able to forget its beauty. I think it is also the same with hotels, as no can ever forget a good service and great hospitality. Whenever you are planning your vacation, you must be very conscientious when it comes to choosing the right hotel. A whole vacation could be ruined if one is offered weak service, yet it would be remarkable if the stay is complemented by high standard service. For me, I can confidently say that my decision to stay at the Hilton Hurghada Resort was definitely the right one. Choosing this place was one of the reasons which made my very short vacation memorable and comfortable. Last month, I headed to Hurghada, one of Egypt’s oldest and most famous resorts, to have a good time by the shores of the Red Sea. Hilton Hurghada was really a perfect fit for a stress-free weekend, not only because it is a five-star hotel, but also for the great hospitality and reasonable prices it offers. Hilton has long been a recognised name in the industry, with people from all over the world visiting it for almost a century. Throughout my three-day stay at Hilton Hurghada, I was surrounded with a very warm atmosphere from all the staff members, who were all cooperative and friendly. I can say that everything was perfect, starting from the mouth-watering food, lovely entertainment, and most important of all, the beach. Personally, I think that staff are a very essential element in hotels, as they can definitely affect your stay and ensure that your needs are catered to. At Hilton, all the staff members were friendly, polite, and professional with prompt service. As for my accommodation, I was staying in one of the rooms which were recently renovated, as part of the hotel’s renovation project. I loved the room, with its blue and brown colours, which are inspired by the sea. I found the room’s modern design and furniture, simple and calming. My room overlooked beautiful scenery, of the hotel’s swimming pool, surrounded by vibrant flowers and greenery. It was my favourite part of the day, when I woke up to this perfect scenery! Regarding the hygiene, as with most people, it was my number one concern. The reality exceeded my expectations for the room’s hygiene and cleanliness, as Hilton Hurghada Resort met the international standards of high-end hotels. The hotel’s housekeeping team made sure that the room was ready and clean before I returned back every day–with fresh bed linen and glassware. My room was also equipped with comforting essentials such as a hair dryer, ironing machine, a shoehorn, a nail file, a loofah, all of those things were great signs of hospitality and made me feel right at home. Moreover, I always came back to my room to find crackers and sweets which was a very nice touch. Now, I will talk about another exciting part of my trip which is the food! During my first day I attended a themed night at Pebbles, the hotel’s main restaurant. The theme was titled ‘Egyptian street’, which reflected Egyptian traditions from food, dances, to customs. The entrance of the restaurant was inviting and appealing as several chefs were standing in a line wearing traditional Egyptian outfits such as the ‘galabiya’ and skullcap while sitting in front of the infamous circled ‘Tabalya’ table. They provided various oriental food from hawawshy, fattah, liver, to mixed grill. Besides the delicious oriental food, Pebbles had an animation team which was dancing to traditional Egyptian music. 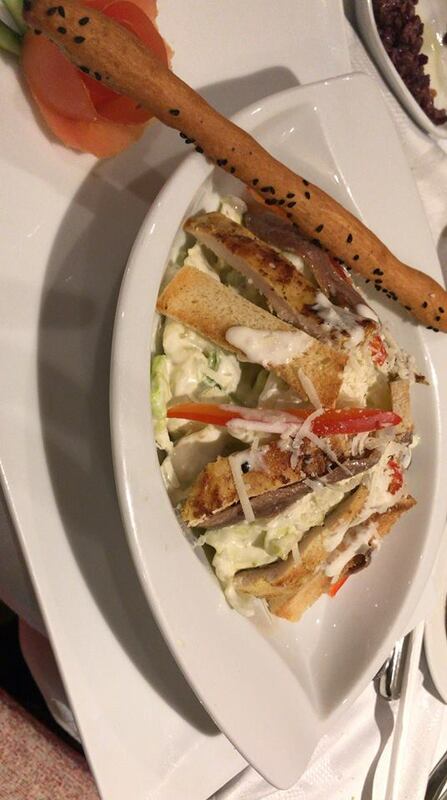 The restaurant was a great balance between delicious food and an enjoyable atmosphere. Moving on to the second day, I had an exquisite barbeque lunch by the picturesque sea. I chose my plate from a menu that included a diverse menu ranging from chicken, beef, pizza, etc. My selected grilled chicken plate arrived hot and inviting, and its taste was even better, as the spices were mouth-watering and delicious, and it was perfectly grilled. 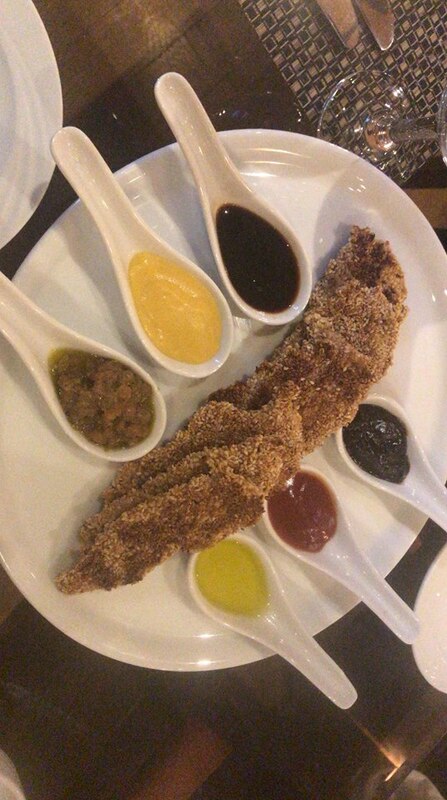 On my third day, I was excited to try the hotel’s Champs bar, where I tried for my first time a chicken breast plate with sesames presented with variety of sauces. At Champs bar, I tried a variety of amazing appetisers including crunchy friend shrimps, chicken wings, spring rolls, samosa, and chicken breast. Although I tried those same appetisers in many restaurants before, I can say that the taste of those ones were really unique–the chef’s secret recipe turned out to be just perfect! My main dish was a medium-cooked beefsteak, which was covered with a melting brown and black pepper sauce, presented with crunchy fries and well-cooked sautéed vegetables. Cooking a perfect steak is not always an easy job for any chef, but it was a really enjoyable meal. During my last day, I was still unable to get enough of the delicious food at Hilton Hurghada Resort, so I headed toward the Italian restaurant, La Casa. For the starter, I ate garlic bread spiced with basil. They also served a perfect mixture of cheese, olives, olive oil, tomatoes with basil sauce as a dip, and a caesar salad covered with a secret tangy dressing. For the main plate, I had a well-fried cordon blue stuffed with cheese, and the best spaghetti bolognese ever. After finishing my enticing meal, it was time for me to leave and get back to Cairo. I sadly walked to my room, and was aided by the most helpful staff, who guided me every step until I got into the cab which took me to the airport. I left the hotel with a yearning to come back again, which I will make sure to do! Reflecting on my stay, it was enjoyable overall, and my weekend getaway turned out to be perfectly relaxing. 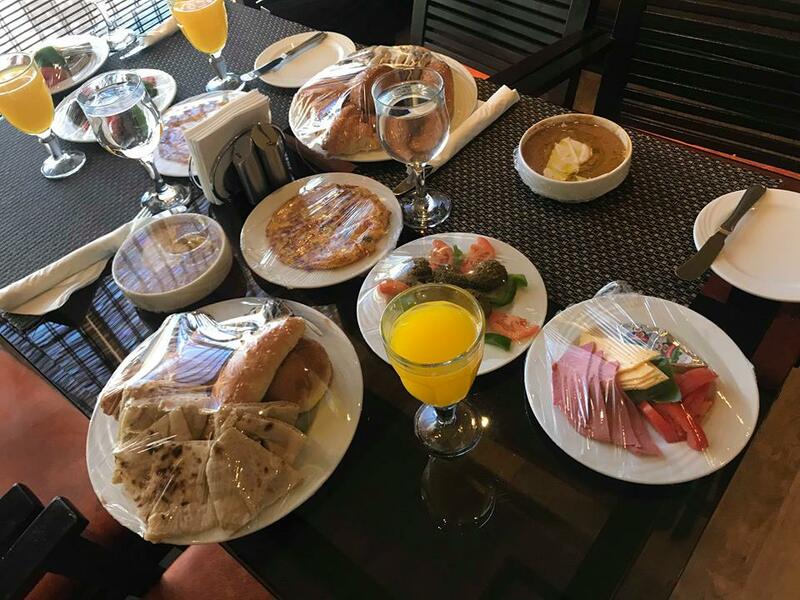 My stay at Hilton Hurghada enabled me to have a peaceful and a stress-free time, coupled with excellent services, and amazing food. My stay exceeded my expectations, and that is why I will definitely choose Hilton Hurghada Resort whenever I return to this beautiful city overlooking the magical Red Sea. The post Services account for 70% of world’s exports, of which 30% are tourist exports appeared first on Daily News Egypt. Services account for 70% of the world’s exports, of which 30% are tourist exports, according to the Minister of Tourism, Rania Al-Mashat. Al-Mashat added that the tourism sector is one of the most vital sectors, and the engine of the Egyptian economy toward a more prosperous future, noting that tourism is one of the most important service exports, positively impacting the Egyptian economy, as reported by the Middle East News Agency (MENA). Her remarks came during her speech in a session organised by Procter and Gamble Egypt, one of the investors in the chemicals industry, on the sidelines of the ‘Diversity and Integration’ week, organised by the company in Egypt, which coincided with International Women’s Day. The minister pointed out that her priorities during the last period were to bring together the parties and entities related to the tourism sector including the government, parliament, the private sector and citizens on a clear plan and vision for the development of the sector. She added that the ministry’s vision aims to achieve the 17 UN sustainable development goals and link them to the tourism industry, which can directly and indirectly contribute toward achieving gender equality and women’s empowerment by providing suitable opportunities and the proper environment for employment in the sector. Al-Mashat pointed out that her goal since taking over the ministry of tourism’s portfolio has been to change the stereotypical image of tourism in Egypt, in order to raise the competitive position of Egypt among the world by modernising the mechanisms of the tourism industry to keep up with the global changes in this area. Furthermore, Al-Mashat assured that the ministry puts training and investment in the human element as a top priority, pointing to the ministry’s keenness to increase women’s training and participation in the tourism sector. In conclusion, the minister highlighted that there are many positive reports which have been published internationally, ranking Egypt among the best tourist destinations for vacations in 2019. The post Egyptian hotel market achieves average 30% RevPAR growth in January appeared first on Daily News Egypt. Egyptian hotel market saw an average revenue per available room (RevPAR) growth of 30% in January, compared to the same period last year, according to Colliers International in its latest MENA Hotels Forecast in February. Colliers explained that the RevPAR growth was driven by both average daily room rate (ADR) and occupancy rate due to strong corporate, leisure, and MICE activities. According to the full year forecast 2019, Cairo, Sharm El Sheikh, Hurghada, and Alexandria to witness an occupancy of 77%, 58%, 68%, 80% respectively. In terms of the RevPAR, Colliers foretasted it to reach $98, $27, $39, $65 respectively in Cairo, Sharm El Sheikh, Hurghada, and Alexandria. “The forecasts for the Egyptian markets continues to be strong, the Red Sea resorts are expected to continue benefitting from positive security perceptions and returning of tourists from major source markets,” according to Colliers. Meanwhile, Colliers stated that the major Egyptian markets are forecasted to see an average RevPAR growth of 13% in 2019 in comparison to last year. On the other hand, the Saudi markets experienced a drop in RevPAR levels in the first month of 2019 compared to the same period last year. to put pressure on the occupancy and average daily rates,” Colliers added. Furthermore, according to Colliers, Abu Dhabi beach and city hotels experienced a RevPAR growth of 6% and 1% respectively in the first month of 2019, compared to the same period last year. The beach hotels in Abu Dhabi are forecasted to seen average RevPAR growth of 2% in 2019 in comparison to last year. Moreover, Aqaba and Beirut hotel markets also saw a growth in RevPAR levels in January 2019 and these markets are forecasted to see a RevPAR growth of 5% and 3% respectively in 2019 (full year). Notably, Colliers International Hotels division is a global network of specialist consultants in hotel, resort, marina, golf, leisure, and spa sectors, dedicated to providing strategic advisory services to owners, developers, and government institutions to extract best values from projects and assets. The post Egypt, Germany discuss boosting tourism cooperation appeared first on Daily News Egypt. Egypt’s Minister of Tourism, Rania Al-Mashat, called for matching Egypt with competing tourist destinations in terms of of the tax imposed on German tourists departing to these destinations, which is determined by the German government on geographical basis. The minister’s request came during her meeting with the German Deputy Minister of Economy, Energy and Tourism, and the chairperson of the Tourism Committee of the ruling party in Germany, and the chairperson of the German Bundestag Tourism Committee, in the presence of the Egyptian ambassador to Germany on the sidelines of the ITB Berlin activities that took place from 6 to 10 March. During the meeting, the minister highlighted the depth of the relations between Egypt and Germany and the cooperation between the two countries in all fields. She pointed out that the German market comes at the head of tourist markets exporting tourism to Egypt, stressing that Egypt always welcomes German tourists. “German tourists arriving to Egypt in June 2017 achieved standard rates which reached 148%, compared to 2016. While the number of German tourists to Egypt reached 90,000, who spent 781,000 tourist nights with an increase of 200%,” according to the State Information System data. “In the first half of 2017, about 503,000 tourists arrived from Germany with an increase of 66% compared to the same period in 2016. They spent 5.1m tourist nights with an increase of 124%. Germany became at the top in tourist market of Egypt on European and international scales,” it continued. For his part, the Chairperson of the Tourism Committee of the ruling party in Germany, Paul Lehriehder, stated that he will push the talkers in the German government regarding matching Egypt with the rest of the competing tourist destinations in terms of the tax imposed on the German tourists departing to Egypt. He also praised the cooperation and political rapprochement between the two countries, stressing the support of the German government for the tourism sector in Egypt, especially for its importance in creating jobs. The post Egypt, Beautiful Destinations sign cooperation protocol to promote tourism appeared first on Daily News Egypt. The Chairperson of the Egyptian Tourism Authority, Ahmed Youssef, signed a cooperation protocol with Jeremy Jauncey, the founder and CEO of Beautiful Destinations, with the aim of promoting tourism to Egypt. The protocol stipulates the preparation of the strategy which will be used in preparing and shooting the promotional content of marketing to Egypt worldwide, as well as executing over 40 promotional and marketing content for various tourist areas in Egypt. The Minister of Tourism, Rania Al-Mashat, witnessed the signing ceremony during the ITB Berlin activities, which is taking place during the period from 6 to 10 March. For her part, Al-Mashat highlighted the importance of this protocol in updating and modernising the ways and techniques of promoting tourism, which is a main pillar in the national structural reform programme for the tourism sector. She mentioned that the traditional ways for promoting tourism have become ineffective and useless, explaining that social networking websites now have a stronger impact on youth. Al-Mashat added that this partnership came after holding intensive meetings with the company, during which she presented a detailed view for the ministry’s target to the company, in view of the structural reform programme. Furthermore, she also noted that the ministry targets to shed light on tourist areas that are unknown to tourists, thus Beautiful Destinations will help the ministry in achieving this target as it is specialised in promoting tourism using modern and non-traditional marketing mechanisms through electronic platforms. For his part, the Founder and CEO of Beautiful Destinations expressed his happiness by this partnership, noting that his company is considered as one of the largest companies worldwide specialised in promoting tourism, explaining that 20 million people from more than 180 countries visit the company’s page on Instagram, Facebook, Snapchat, YouTube, and Weibo. Jauncey added that his company believes in the importance of tourism as an engine for countries’ economic development, mentioning that the company is committed toward implementing the concepts of sustainable development in line with the vision of the Egyptian Ministry of Tourism. On the other hand, during the participation of Egypt in the ITB Berlin activities, the minister of tourism met with her Greek and Cypriot counterparts, Elena Kountoura and Savvas Perdios respectively, with the aim of discussing ways to enhance the cooperation in the tourism field. During the meeting, they discussed reinforcing the trilateral cooperation and agreed on forming task forces from both the governmental and private sectors in order to create joint tourist schemes with the aim of attracting more tourists. Moreover, they also agreed that the three countries will participate in international exhibitions specialised in cruise tourism during the coming period, such as the Posidonia Maritime Transport Exhibition. Finally, the three ministers praised the political and economic relations binding the three countries, expressing their keenness to increase cooperation in tourism among them. The post Ukraine to launch first flight to Alamain soon: ambassador appeared first on Daily News Egypt. The Ukrainian ambassador to Egypt, Hennadii Latii, announced launching the first flight from Ukraine to the Al Alamain International Airport soon. During his meeting with the Egyptian Minister of Tourism, Rania Al-Mashat, Latii said that there are 110 flights between the Ukrainian and Egyptian cities. The Al Alamain International Airport is one of two airports that serve the New Al Alamain City. Both sides discussed means for enhancing cooperation in the field of tourism and increasing the tourist influx from the Ukrainian market. Latii stressed his country’s interest in cooperation with Egypt in the political, economic, and tourism fields, pointing out that the Ukrainian people know a lot about Egypt and have a great desire to visit it and learn about its civilization. For her part, Al-Mashat assured the depth of the Egyptian-Ukrainian relations in many fields, including tourism. She added that the Ukrainian market is one of the most promising markets for Egyptian tourism, ranking second among top ten tourist exporter countries to Egypt in 2018. The minister also discussed with Latii the promotion and activation of the structural reform programme for the development of the sector, which includes targeting new tourist markets through which the ministry will diversify the target tourist markets. At the end of the meeting, the ambassador invited Al-Mashat to visit Ukraine to exchange information and discuss ways for boosting bilateral cooperation to promote the Egyptian tourism. The post Direct flights between Cairo, Warsaw to reach 5 per week by next year: Polish ambassador appeared first on Daily News Egypt. The ambassador of Poland to Cairo, Michal labenda, stated that the direct flights between Cairo and Warsaw will increase by the winter of 2020, reaching five flights weekly, instead of only four. He mentioned that there are already charter flights from different Polish cities to Sharm el-Sheikh and Hurghada. His remarks came during his meeting with the chairperson of the Egyptian Tourism Promotion Authority, Ahmed Youssef. During the meeting, the two sides discussed enhancing the joint cooperation in the field of tourism, reviewing the ways to boost the Polish tourism movement to Egypt. For his part, the Polish ambassador expressed his optimism about increasing the Polish tourism movement to Egypt during the next period, stressing the need to work hand in hand with the Egyptian side in order to revive the polish tourism movement in Egypt, in order to reach the level before the downturn in 2011 after the 25 January Revolution. In that context, Youssef assured the importance of the Polish market for the Egyptian tourism, noting that it was one of the most important countries with a high number of tourists visiting Egypt in 2010, hoping for the number of Polish tourists coming to Egypt to increase during the next period. “Egypt was one of the most important tourist destinations for Polish tourists, ranking fifth among the world in the list of countries with the highest number of tourists visiting Egypt,” according to the State Information Service. “Moreover, the number of Polish tourists in 2015 exceeded 300,000, making Egypt’s share in the Polish tourism market ranging between 35% and 45%,” the State Information Service’s data declared. During the meeting, Youssef stressed on the ministry of tourism’s determination to diversify the tourist markets which contribute to the Egyptian tourism sector, and to also use modern promotional mechanisms to increase the rates of tourists coming from the Polish market. Moreover, He also assured the ministry’s keenness to introduce the distinguished Egyptian touristic destinations to the tourists coming from Poland. The post Sharm El Sheikh’s hotel occupancy to grow by 7% in FY 2019: Colliers appeared first on Daily News Egypt. “Sharm El Sheikh is expected to obtain the highest growth in occupancy (7%), while Hurghada and Alexandria are both expected to see a 9% improvement in average daily rate (ADR) in fiscal year (FY) 2019 over FY 2018,” according to Colliers International MENA 2018 full year review report. Concerning the Egyptian hotels’ performance in 2018, the report stated that the FY 2018 was the second year in a row with improved performance for each market in Egypt. “Occupancy rate for hotels in Sharm El Sheikh and Hurghada increased by 22%, and 26% respectively in 2018, with expectations for Hurgahda’s hotel occupancy rate to grow by 5% in 2019,” Colliers stated. It explained that Cairo’s hotels’ occupancy rate increased by 10% in FY 2018, compared to FY 2017, while in 2019, it is expected to increase by 4%. Meanwhile, “Alexandria’s hotels’ occupancy rate hiked by 11% in FY 2018, with expectations to grow by 3% in FY 2019,” Colliers added. In terms of the ADR, Colliers mentioned that Cairo’s hotels’ ADR witnessed an improvement by 13% in FY 2018, forecasting that it will witness a 5% improvement in FY 2019. Moreover, “The hotels’ ADR in Alexandria, Sharm El Sheikh, and Hurghada witnessed a 15%, 25%,25% improvement in FY 2018,” Colliers revealed. It also said that Sharm El Sheikh is forecasted to see a growth in the ADR by 6% in FY 2019. Meanwhile, Colliers stated that the Egyptian hotel market is to expand its key supply by 2% annually between 2019 and 2021. “A 6.7% increase was witnessed in Alexandria’s hotels’ supply in FY 2018, compared to FY 2017. In terms of Cairo, it witnessed only a 5.7% increase in its hotels’ supply,” according to Colliers. Notably, the report highlights the percentage change in branded supply from FY 2017 to FY 2018, in each of the respective markets analysed in the sector. Talking about the MENA region, Colliers stated that new brands launched in the MENA market in 2018 ranged from luxury to budget, pointing out that these new brands help diversify a market that has been criticised for its focus on the luxury and upscale segments in previous years. The post Egypt one of most important tourist destinations for Czechs: Czech Minister of Tourism appeared first on Daily News Egypt. “Egypt has become the most important tourist destination for the Czech Republic, after Croatia and Greece, especially in the beach tourism,” said the Czech’s Minister for Regional Development, Klára Dostálová. She explained that there is a great increase in the Czech tourism movement to Egypt. Her remarks came during the opening of the Egyptian pavilion at the Holiday World 2019, which is Prague’s international exhibition for tourism. “The Prague international exhibition is one of the biggest professional and public exhibitions in the Czech Republic, as well as in Central and Eastern Europe. It is held annually on an area of 18,800 sqm and is attended by about 634 exhibitors from more than 45 countries in the world,” according to the State Information Service. On the side-lines of the exhibition, Mohamed Hendam, Egypt’s ambassador to the Czech Republic, held an extensive meeting with representatives of tour operators from Egyptian companies to review the developments of Egyptian tourism and their proposals on increasing the number of Czech tourists to Egypt, as the international tourism fair this year witnessed a diversity in the Egyptian tourist product offered. “Concerning the number of Czech tourists to Egypt, the number of tourists has risen to 203,000 tourists in 2017, up from 90,000 tourists in 2016, an increase of 125%,” according to the State Information Service. The post ETF’s elections first step in legislative reform: Al-Mashat appeared first on Daily News Egypt. The Minister of Tourism, Rania Al-Mashat, stated that the Egyptian Tourism Federation’s (ETF) elections is the first step in the legislative reform. She added that the elections’ file was topping the ministry’s priorities during the last period, noting that she has confirmed more than once that after the execution of the ETF’s and the five tourist chambers elections, the first pillar of the legislative reform programme would be achieved. The elections would mark the sector’s first time in more than three years, to elect councils which represent it and express its demands. Al-Mashat’s remarks came on Monday night during the first press conference to be held with the federation after the elections, declaring the joint work plan during the coming period. During the conference, the minister reviewed the five axes of the structural reform programme for the development of the tourism sector, which was launched by the ministry last November. In that context, the minister stated to Daily News Egypt that the structural reform programme includes different pillars, such as institutional reforms, legislative reforms, promotion and marketing activities, infrastructural and tourism development, as well as the global trends programme. During the conference, she stressed the role of the ETF and its chambers in achieving the axes of this programme, especially with regard to the legislative reforms necessary for the laws and regulations governing the tourism sector, which were issued more than forty years ago without any change. Furthermore, the minister also pointed to the continuous coordination and cooperation between the ministry and the committee of tourism and civil aviation in the Egyptian House of Representatives to promote this vital sector. Al-Mashat concluded that the ministry seeks to make use of the recent growth in tourism through solving the problems facing this vital field, and improving the skills of tourism staff. For his part, Ahmed Al-Waseef, the newly elected ETF president stated that the federation is currently working on restructuring its departments, praising the role of the minister of tourism in holding the elections of the federation and its five chambers, which was the first demand of the tourism sector. The post Egypt, China discuss enhancing bilateral tourism relations appeared first on Daily News Egypt. On behalf of the Minister of Tourism, Rania Al-Mashat, the Tourism Adviser at the ministry of tourism, Soha Bahgat, discussed with a Chinese delegation headed by the deputy governor of Sichuan province, the aspects of the cooperation between the two countries in the tourism field. This came after the operation of a new direct flight between the two countries, and after receiving the first Chinese flights from Sichuan province to Cairo, which is expected to attract more Chinese tourists. During the meeting, Bahgat stressed the importance of the Chinese market as one of the most promising tourism markets, assuring that the state is aiming to attract more Chinese tourists to Egypt. In that context, Al-Mashat told Daily News Egypt (DNE) earlier that the ministry aims to diversify the revenue streams and increase the sector’s resilience by attracting new markets. She explained that this could be achieved through increasing promotional efforts in new source markets, including Asia (particularly China). She also revealed that during the period from January to October 2018, Asian tourists represented 5.62% of the total number of tourists who visited Egypt during that period. For his part, the governor of China’s Sichuan province expressed his country’s aspiration for further cultural and touristic cooperation with Egypt. Talking about the Egyptian-Chinese tourism relations, Sameh Saad, the former tourism adviser at the ministry of tourism, stated that there are no accurate statistics on Chinese tourism in Egypt, but he thinks that it doubled in the last period, giving the reason behind the increase as the exchange of visits between both presidents. He continued that the only shortcoming which the Egyptian-Chinese tourism relations face is the absence of controls for price reductions for hotels, and tourism operators, etc. Agreeing with Saad, the former Head of International Tourism at the Tourism Promotion Authority, Ahmed Shoukry, told DNE that the number of Chinese tourists is increasing, assuring that Egypt needs to increase the capacity of the direct flights between Egypt and China, as the Chinese market is a very beneficial market for Egypt. He explained that Chinese tourism in Egypt is represented by two segments, the first one is purely tourism segment which comes to enjoy the cultural tourism in Egypt, while the second segment which visits Egypt with a business purpose. Moreover, Saad noted that the average spending of the first type is much lower than the second one, thus he assured that Egypt should exploit the presence of the latter type as it aims to increase investments and the tourism revenues in Egypt, which will subsequently enhance the Egyptian economy. The post Egypt’s hotel market sees 42% RevPAR growth in 2018 appeared first on Daily News Egypt. Egyptian hotels in different governorates, such as Cairo, Hurghada, Sharm El Sheikh, and Alexandria saw an average revenue per available rooms (RevPAR) growth of 42% in 2018 compared to 2017, according to Colliers International’s MENA Hotel Forecast for 2019. Colliers said that Egypt’s hotels RevPAR growth is driven by both average daily rates (ADR) and occupancy due to strong corporate, leisure, and MICE activity (meetings, incentives, conventions, and events). The report’s forecast for the Egyptian market continues to be strong. The Red Sea resorts are expected to continue benefitting from positive security perceptions and returning of tourists from major source markets. The major Egyptian markets are forecasted to see an average RevPAR growth of 11% in 2019 in comparison to last year. According to the report, Cairo hotels is projected to achieve 9% growth in RevPAR Year-over-Year (Y-o-Y) and estimated occupancy at 77% with $128 ADR and $98 RevPAR, while Sharm El Sheikh hotels’ RevPAR forecast worth $27 with 12% growth in RevPAR Y-o-Y and predicted that occupancy will reach 58% for the full year forecast. The report elaborated that Hurghada hotels will achieve 13% growth in RevPAR Y-o-Y and 68% occupancy rates, meanwhile the report expected that Alexandria hotel market will register 81% occupancy rates with 10% growth in RevPAR Y-o-Y. “Amongst the Saudi market, hotels in Jeddah achieved higher performance levels (9% increase in RevPAR) in 2018 in comparison to 2017, mostly driven by the ADR. New supply will enter the Saudi market over the short to medium term, this is expected to put pressure on the occupancy and average daily rates. Jeddah hotel market is forecasted to see an average RevPAR growth of 3% in 2019 in comparison to last year,” the report read. Dubai’s hotel market is experiencing growing demand from price-sensitive source markets resulting in a drop in average daily rates, adversely impacting RevPAR. The market is forecasted to see similar performance trends in 2019 in comparison to last year, the report noted. It also highlighted that Abu Dhabi beach hotels experienced relatively stable performance levels in 2018 with an increase in occupancy. The beach hotels in Abu Dhabi are forecasted to see an average RevPAR growth of 1% in 2019 in comparison to last year. The post Private equity fund to revitalise financially impaired hotels, says Al-Mashat appeared first on Daily News Egypt. The Minister of Tourism, Rania Al-Mashat, informed Daily News Egypt that the private equity fund aims to restructure the financially impaired hotels and the other tourism establishments through launching a hotel development fund to provide them with capital, which enables the ministry to conduct the necessary investments. She added that her ministry is coordinating with experts to manage the hotel development fund, while cooperating with Egyptian banks with the purpose of restructuring the debts incurred from the tourism sector’s establishments. Al-Mashat announced last November that the government plans to establish a new private equity fund in order to upgrade Egypt’s hotels as well as to provide new investment opportunities in the sector. In terms of the government’s plans which aim to develop the tourism sector, the minister noted that there is a structural reform programme which includes different pillars, such as institutional and legislative reforms, promotion and marketing activities, infrastructural and tourism development, as well as the global trends programme. Al-Mashat pointed out that the ministry is planning to set a strategy for sustainable tourism development until 2030, which aims to diversify Egypt’s tourism product, increases the number of tourists’ nights in the country, as well as creates direct and indirect employment with the community’s integration. The tourism sector in Egypt has suffered a downturn since the 25 January Revolution in 2011, and also after a Russian passenger plane crashed in Sinai in late October 2015 and all its passengers were killed. Yet, since 2018, the sector began to revitalise again, regaining its previous position. The post 2019: Getting over challenges and eyeing more opportunities appeared first on Daily News Egypt. The post Every Egyptian household would have at least one direct or indirect worker in tourism: Al-Mashat appeared first on Daily News Egypt. The tourism sector in Egypt suffered a downturn since the 2011 Revolution, and the sector in Egypt suffered a devastating blow, especially when a Russian passenger plane crashed in Sinai in late October 2015 and all its passengers were killed. Thus Earlier, Minister of Tourism, Rania-Al-Mashat, said earlier that the number of tourists to Egypt increased by 40% during the first nine months of 2018 (9M18), compared to the same period last year. Furthermore, an overwhelming majority of tourism experts are projecting that 2019 is the year of opportunities for the tourism sector, thus Daily News Egypt (DNE) was eager to learn from the Minister of Tourism, Rania Al-Mashat, about the ministry’s upcoming plans. Notably, the minister stated during the 2019 World Economic Forum’s annual meeting in Davos, that 2018 was one of the strongest years for Egypt’s tourism, asserting that the ministry aims to further boost the sector during 2019. Al-Mashat told DNE that the ministry’s vision is based on reaching a sustainable tourism sector through implementing structural reforms which will strengthen the sector’s competitiveness, and are with international standards. “My ultimate objective as the minister of tourism is to eventually have at least one individual from each Egyptian household working either directly or indirectly in the tourism sector,” she added. In terms of the government’s plans which aim to develop the tourism sector, the minister noted that there is a structural reform programme which includes different pillars, such as institutional reforms, legislative reforms, promotion and marketing activities, infrastructural and tourism development, as well as the global trends programme. Discussing Egypt’s touristic base, the minister declared that the ministry aims to diversify the revenue streams and increase the sector’s resilience by attracting new markets. She explained that this could be achieved through increasing promotional efforts in new source markets, including Asia (particularly China), East Europe (especially Ukraine), and Latin America. This could be carried out through organising workshops with Arab states (particularly countries of the Gulf Cooperation Council) in order to determine the most effective promotion tools, in addition to participating in national and international conferences to promote Egypt as an attractive and an all-year-long touristic destination. 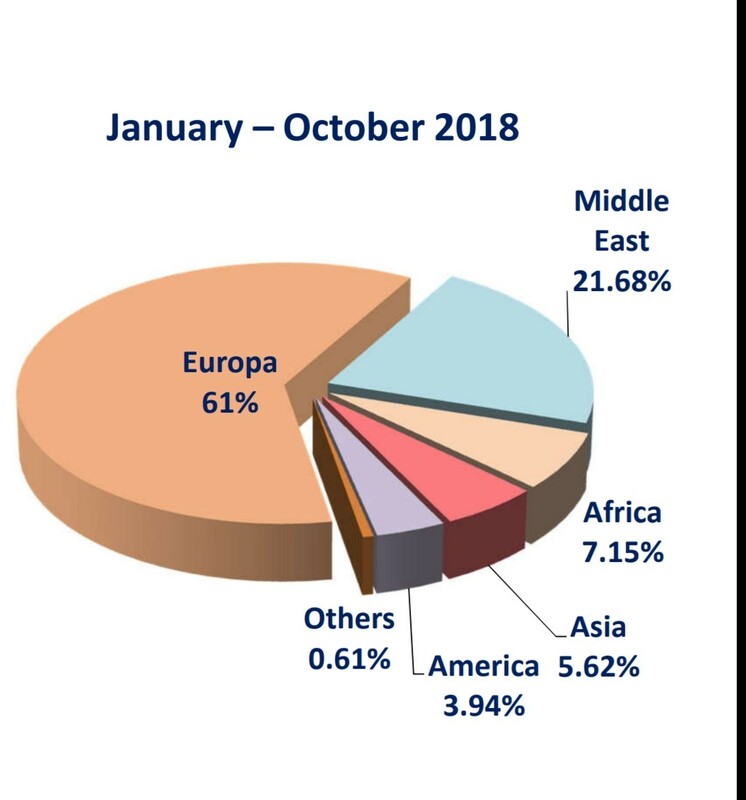 She revealed that during the period from January to October 2018, European tourists represented 61% of the total number of tourists who visited Egypt during that period, while tourists from the Middle East represented 21.68%, Africa only 7.15%, Asia with 5.62%, and America with 3.94%, while other countries represented only 0.61%. “The P2P intends to shift tourists’ perception on the one hand, and encourages community engagement on the other hand,” Al-Mashat explained. She ensured that sustainable tourism is not just about places, but is also about the people and communities living in those locations. The ministry is also looking forward toward promoting the opening of the Grand Egyptian Museum, one of the largest museums in the world. Moreover, Al-Mashat stated that the ministry seeks also to adopt modern, digital, and competitive promotion approaches through branding by destination, creating an identity for each of Egypt’s tourism destinations, in addition to launching new campaigns in order to showcase Egypt’s contemporary dimension. She also assured that utilising the ministry’s presence at international travel exhibitions in order to employ its full promotional potential—while focusing on quality not quantity—is very important. “Our goal is to improve and elevate the skillset of the tourism sector’s workforce, through different procedures such as cooperating with the private sector, technical and vocational education training, reaching out to donors and supporting civil society organisations, in order to conduct training courses to improve employee skills, and also through rehabilitating and restructuring the ministry’s training centres,” she declared. Likewise, the minster explained that her ministry also plans to ensure that the quantity of the workforce, and its quality, meet the labour market’s needs, by implementing a plan to enhance the graduates’ of hotel and tourism faculties qualifications in order to meet the sector’s requirements. Over and above, Al-Mashat stated that the sector will also be enhanced through developing specialised technical training programmes for graduates and job seekers in various tourism fields, setting criteria for job admissions in cooperation with the responsible chamber, conducting comprehensive assessments of the ministry’s staff training needs, as well as developing programmes in order to enhance the employees’ soft skills. “Moreover, we seek to redefine our partnerships with the various intergovernmental organisations and foreign developmental agencies, in order to work toward achieving the sustainable development goals (SDGs) through identifying crosscutting areas regarding the SDGs and tourism, and by identifying national partner ministries to cooperate with on various sustainable tourism projects, in addition to pinpointing international partners to collaborate with, implementing sustainable tourism projects as well as establish a ‘Sustainable Tourism Unit’ within the ministry,” she noted. Similarly, Al-Mashat stated that the government seeks to integrate the local community and enhance their development—especially those who live around Egyptian cultural heritage sites—in collaboration with international donors through implementing a USAID project on “Sustainable Investment in Tourism in Egypt”, which aims to link cultural heritage assets to tourism developmental activities, and to improve the skills of workers, in collaboration with the ministry of antiquities. “This is in addition to building connections between cultural heritage sites and the surrounding communities, in order to provide incentives for the local inhabitants to protect and preserve the sites. Moreover, the project aims to protect and restore cultural heritage sites from damage caused by ground water intrusion, and to produce sustainable site management plans for cultural heritage sites, in collaboration with the ministry of antiquities,” she further explained. Commenting on the private equity fund, the minster explained that it aims to restructure financially impaired hotels and other tourism establishments through establishing a hotel development fund in order to provide them with capital, which enables the ministry to conduct the necessary investments. The ministry is also coordinating with experts in order to manage the fund, and with Egyptian banks with the purpose of restructuring the debt incurred from the tourism sector’s establishments. The post International tourist arrivals reach 1.4 billion: UNWTO in 2018 appeared first on Daily News Egypt. The United Nations World Tourism Organisation (UNWTO) stated in its last report that worldwide international tourist arrivals (overnight visitors) increased 6% to 1.4 billion in 2018, clearly above the 3.7% growth registered in the global economy. “In relative terms, the Middle East (+10%), Africa (+7%), Asia and the Pacific and Europe (both at +6%) led growth in 2018. Arrivals to the Americas were below the world average (+3%),” the UNWTO added. “The growth of tourism in recent years confirms that the sector is today one of the most powerful drivers of economic growth and development. It is our responsibility to manage it in a sustainable manner and translate this expansion into real benefits for all countries, and particularly, to all local communities, creating opportunities for jobs and entrepreneurship and leaving no one behind” said the UNWTO secretary-general Zurab Pololikashvili. “This is why the UNWTO is focusing 2019 on education, skills, and job creation,” Pololikashvili added. The UNWTO’s long-term forecast published in 2010 predicted the 1.4 billion mark of international tourist arrivals for 2020. Yet stronger economic growth, more affordable air travel, technological changes, new businesses models, and greater visa facilitation around the word have accelerated growth in recent years. The UNWTO classified the result by regions, explaining that international tourist arrivals in Europe reached 713 million in 2018, a notable 6% increase over an exceptionally strong 2017. It added that growth was driven by Southern and Mediterranean Europe (+7%), Central and Eastern Europe (+6%) and Western Europe (+6%), while results in Northern Europe were flat due to the weakness of arrivals to the United Kingdom. “Asia and the Pacific (+6%) recorded 343 million international tourist arrivals in 2018. Also arrivals in South-East Asia grew 7%, followed by North-East Asia (+6%) and South Asia (+5%) and Oceania showed more moderate growth at +3%,” the UNWTO stated. “The Americas (+3%) welcomed 217 million international arrivals in 2018, with mixed results across destinations. Growth was led by North America (+4%), and followed by South America (+3%), while Central America and the Caribbean (both -2%) reached very mixed results, the latter reflecting the impact of the September 2017 hurricanes Irma and Maria,” the UNWTO added. Based on current trends, economic prospects and the UNWTO Confidence Index, the UNWTO forecasts international arrivals to grow 3% to 4% next year, more in line with historic growth trends. Overall, 2019 is expected to see the consolidation among consumers of emerging trends as for example the quest for ‘travel to change and to show’, ‘the pursuit of healthy options’ such as walking, wellness and sports tourism, ‘multigenerational travel’ as a result of demographic changes, and more responsible travel.